Acknowledged author wrote Financial Management: Concepts and Applications comprising 360 pages back in 2014. Textbook and etextbook are published under ISBN 013293664X and 9780132936644. 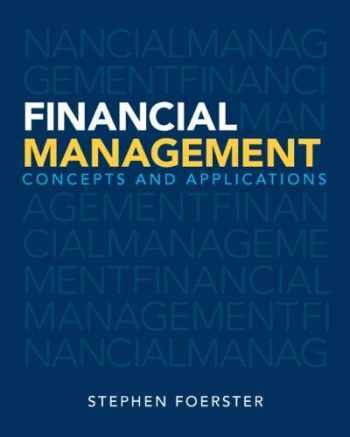 Since then Financial Management: Concepts and Applications textbook was available to sell back to BooksRun online for the top buyback price of $57.39 or rent at the marketplace. For courses in Corporate Finance A balanced overview of financial management theory and practice Finance is one of the key drivers of a firm’s activities, and a critical component to understanding business in general. Financial Management: Concepts and Applications is designed to help students with no prior knowledge grasp the applications and relevance of finance. Author Stephen Foerster reveals the practical side of finance, rather than just its theoretical concepts, and shows how finance intersects with many other areas of business. Thoroughly integrated with the text, MyFinanceLab places personalized practice opportunities just a few clicks away and provides a truly interactive learning experience. This program provides a better teaching and learning experience—for you and your students. It will help you to: • Personalize learning with MyFinanceLab: This online homework, tutorial, and assessment program provides students the help they need, when they need it, and allows unlimited practice.• Encourage students to focus on the big picture: A thematic approach helps students achieve a holistic view of how finance impacts many aspects of business.• Highlight applications of finance: A strong emphasis on applications helps students see the relevance of finance, and keeps them interested in the course.• Foster thorough understanding via learning aids: Various tools, throughout the text and at the end of each chapter, support students as they learn and review. Note: If you are purchasing the standalone text or electronic version, MyFinanceLab does not come automatically packaged with the text. To purchase MyFinanceLab please visit www.myfinancelab.com or you can purchase a package of the physical text + MyFinanceLab by searching for 0133578089 / 9780133578089. MyFinanceLab¿ is not a self-paced technology and should only be purchased when required by an instructor.